Mickey is developing specialized equipment for several major players in the oil & gas field. 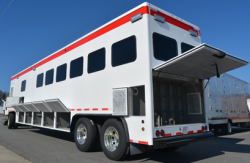 Mickey Truck Bodies continues to make significant advances in the oil & gas industry by developing specialized prototype equipment for several major players in the business. Since entering the business a year ago, Mickey has built numerous data trailers and vans; chemical van units; and control cabins for use at drilling sites. Interior of a Mickey-manufactured data center. Mickey employs a unique Service Delivery Model to turn a customer’s requirements into engineering solutions. The SDM starts with a clear understanding of the customer’s business objectives and an accurate assessment of the specific vehicle’s operational environment to deliver a final product on spec, on time and on budget. The process also draws on Mickey’s century-plus of vehicle engineering and manufacturing experience, expertise and innovation. 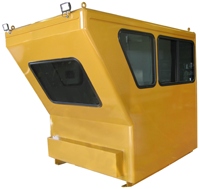 Control Cabins are part of Mickey’s oil & gas product line. Russel Kozak, who joined Mickey in January as Sales Engineer for Oil & Gas on the Engineered Vehicles Team, has been instrumental in the company’s acceleration into the oil & gas field. He’s responsible for new product engineering and development of specialty oil & gas equipment. Prior to Mickey, Kozak was Engineering Manager and Chief Engineer for the Custom Division of General Truck Body Mfg. 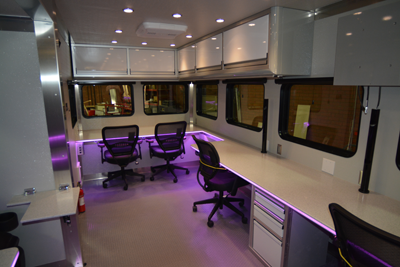 Co., the leading manufacturer of custom specialty oil well service vehicles based in Houston, TX.